Digit got to chat with Justin McLeod, the founder and CEO of Hinge and Samir Kapadia, who is leading the operations in India, on how Hinge works and about its plans for India. Dating apps are storming into the market and they are no longer restricted to only the ones who are having a hard time meeting people in real life and it is no longer about filling out endless forms or paying a huge subscription fee. The dating scene globally is changing effectively and Hinge, a dating app that lets you meet people through your second and third-degree connections on Facebook, is trying to make it easier. 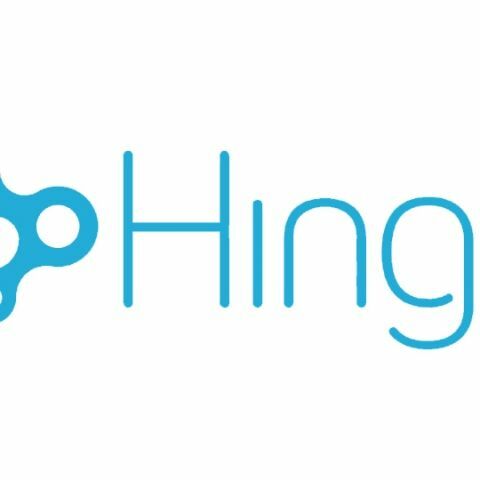 Foraying into the Indian market, Hinge was launched in Mumbai and it aims to spread further to the other parts of the country soon. Digit got to chat with Justin McLeod, the founder and CEO of Hinge and Samir Kapadia, who is leading the operations in India, on how Hinge works and about its plans for India. The interview has been faintly edited for better clarity. Digit: Starting off with the story of how Hinge came to be, was it a dramatic outcome of a failed love story or were you trying to solve a problem in the first place? Justin: I was at the end of my second year at Harvard Business School, and for someone who is about to go into management consulting it is going to be hard to meet new people when you’re travelling all the time. I didn’t want to join a Match.com or OkCupid because that seemed kind of an overkill but I wanted to do something that really felt like the way I met people in real life through my friends or acquaintances. I didn’t wanted to fill a long profile or do anything that you have to do on a traditional dating site, and that’s kind of where Hinge came from in 2011. I grew up coding a lot and I did some of it in the very beginning but initially we had a couple of developers down in Argentina who worked with us and then eventually we hired in-house developers. Digit: A simple search on dating apps throws me an endless list of services and applications on the web and mobile. As a user, if I want to look for singles with a dating prospective, why will I pick Hinge? 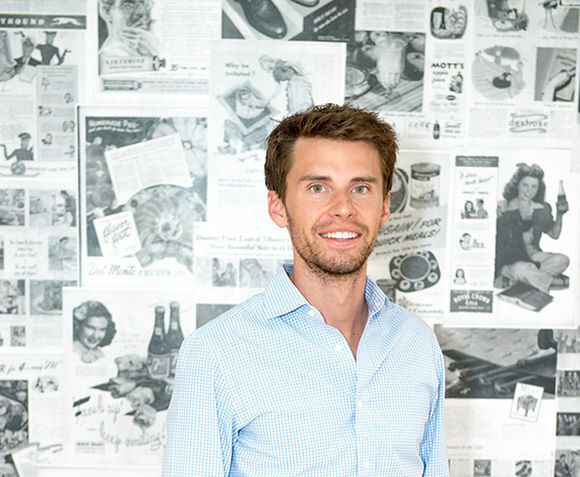 Justin: We think of Hinge as the easiest way to meet the best people for you. That’s because we really believe in the power of meeting through your friends. Not only does this give you great people because they are the type of people filtered by your social network, it’s the easiest thing to do. You have already gone through the hard work of building up your social network, figuring out who your friends are and now we are using the power of that to show you great matches. In addition to that, in your social networks you have a level of transparency and accountability you don’t have anywhere else. So, on OkCupid someone could say anything on their profile and it doesn’t have to be true but there’s something about going through friends where you have that level of validation, transparency and you really know who that person is and this is sort of different from the anonymity that you see on pretty much any other dating service. No other dating service is as transparent and accountable as ours is since no one shows where you work, where you went to school, who your mutual friends are, and I think that’s a huge difference. Digit: How does the match-making work? Does Hinge have a unique algorithm running that searches users based on their interests? Justin: We are starting with the subset of people who are friends of friends and third-degree connections on Facebook. We are learning your tastes over time as you start to use it. So, we can learn whether you like to be matched up through a particular set of friends, or you like people working in law and not in finance or whether you like people belonging to a specific religion. We have kind of a good friend who has sort of been with you and watched your tastes over time and can recommend the best people in the social network for you. The more you use Hinge, the more we can parse out your tendencies and show you more people according to your preferences. Digit: So, a Facebook account is essential to have an account on Hinge? Why did you choose Facebook to authenticate the identity of a user? Justin: That’s right, you have to have a Facebook account and a compatible mobile device, an iPhone or an Android phone. The important thing here is to be linked to the place where people have already mapped out their real world social connections. And that’s why we don’t use something like Twitter for example, that’s because if you follow someone, it doesn’t really mean that you’re connected to them, so it’s more about the symmetrical connection, the map of people you actually know in real life because what we’re trying to do is mirror the real life experience of meeting through friends. So, wherever that map exists, we try to link on to. Third degree connections are simply like a friend of a friend of a friend, it’s like a friend and I go out and we each bring a friend and they end up liking each other, so it’s not a very distant connection. When we look at the data, we learn that a second or third degree connection is highly likely to be relevant to you and if you go any further than that there’s a huge drop in terms of your likelihood of having a mutual interest in one another. You won’t be able to meet people who are far outside your network, and for the average user if you consider has 500 hundred friends on Facebook, it means that the average user has 25,000 friends of friends so, your third degree connection graph is quite large. And we limit that to the people that live in your city and people who fill your tastes and gender preferences and everything else but it’s still a pretty large network. Getting back to the transparency and accountability, anyone can find 2-3 super flattering photographs of themselves and then you get out on a date and realise this person doesn’t look anything like the photographs. We believe that it’s not just about looks but looks matter to some people, so you have to upload 16 photos and of course you can change those out as long as they are validated through Facebook. We do like people to be fully represented in the app so that when you go out and meet up that person, you know that you’re not wasting your time or you’re being misled in any way. Digit: Tinder is essentially also a location based dating app. So what are the possibilities as a Hinge user when you enter into a different or new city? Justin: It is possible to change your location on Hinge if you were to go to a different city, provided that it is a city where we are currently operating. We concentrate much more on the power of social networks and less on geolocation, so just because someone is in the same two mile radius of you doesn’t really mean that much and especially in a city like Mumbai, you have the breadth of humanity. It is great but doesn’t mean that the set of people are going to be great for you romantically. Digit: On the Play Store, we saw that the app has a very low rating and came across a few user reviews where they were cribbing about their privacy being violated. Why's that? Justin: The Play Store keeps your rating from all of history and piles them up into sort of one. So when we started 2-3 years ago, we had a very different version of the app which was a lot harder to navigate so that’s the reason of the drag on the user rating, it’s more of a legacy issue. When it comes to privacy, we take privacy very seriously. We never get any reports and the ones we do are typically misunderstandings. We don’t post to your Facebook profile, we keep all your data essentially anonymised. People at the company don’t have access to the data except the people who work at customer service or deep in the algorithms and we don’t sell user data. We have the best in class privacy standards. Digit: What do your stats say? How is your growth and user activity, and what kind of a retention rate are you seeing? Digit: Hinge started off as a web application in the beginning and was there before Tinder, when did you think you had to go mobile? Justin: In 2011-12 we were a web application and in mid-2012 we started to realise while we saw mobile as the eventual future, that the future was already here and in mid-late 2012, we decided to tear down the existing web application infrastructure and rebuild for mobile and relaunch in February 2013. Digit: Dating apps are picking up the rage in India. There’s Tinder and OkCupid and also a few homegrown dating apps like Thrill, Woo and Truly Madly, how do you plan to compete with them? What made you tick that this was the right time to enter India's online dating scene? Justin: It has always been in our mind that we wanted to come here eventually. The market is huge, it is the second biggest Facebook market next to the US and it really just felt like from my experience here and from my friends who are much familiar with the culture more than I am. The power of your social connections, your social relationships when it comes to dating and relationships is part of the culture here. When I sense it, it almost feels like Hinge is tailored for this market so, I think it has always been a goal of ours to launch here since we started launching internationally. And speaking about competition, Samir here has been on the ground so he can talk about that. Samir: I think that the competitive landscape is diverse, when in the past you’ve seen six new entrants whether they have just come into the market or got a second round of funding, so you’re seeing major trends here. You’re seeing this sort of bifurcation between matrimonial and casual encounters/dating apps. There have been a few that have sat in the middle finding themselves a sort of paradox with users but aside from that, one of the things they are doing is focusing on how do they bring credibility. Whether that’s through having digital defences for women, having people fill out long exhaustive forms and all of these precautionary measures that they use to ensure quality control but also to curate a good experience for women. We find that we don’t have to do any of that, Hinge has the ability to naturally do that by looking at your own social network with the transparency and accountability that Justin brought about, and these experiences are much better. An interesting statistic is that globally when you’re looking at the gender breakdown with these apps, you’ll find a sort of 60:40 or 70:30 men to women ratio, but Hinge takes in 50:50 and I think that’s a powerful statistic. Given the way that a lot of the apps, whether there’s Thrill or Woo or Truly Madly, the way they are trying to communicate to women, that safety and that accountability, is already built in our DNA, so we find that to be our powerful competitive advantage. Some of them have also tried subscription models or other ways to weed out those that they might find to be essentially taking advantage of the service. Once again Hinge is very much based on leveraging social and we kind of cut through the noise with that natural solution to what we are seeing in the marketplace right now. It’s the extension of reality into our platform which is so compelling. Justin: When we launch in a new market and we spend some money on advertising and launch events, we’ll start out at something more like 60:40 or 70:30 but very quickly women catch up and it spreads virally among women because they have such a good experience on the app than the other apps. And when we ask them what they most value about Hinge, first is the quality of the people they are seeing on the app. The curation from your social network is so much of a better experience and that’s the number one thing that men and women say. The second thing for women is the accountability, it’s the idea that because I know the last name, where they work or where they went to school, I know we are socially connected. We never had issues about people being inappropriate or acting inappropriately during interactions on the app. Digit: Dating in India is something people raise their eyebrows to and yet isn’t socially acceptable, so do you plan on waiting until the dating scene in India grows? Samir: The current way that we look at the Indian market is really think of Hinge as a social network and it’s really about looking within your social network and finding those meaningful matches, as in bringing dating back to reality. The way that things are right now, it’s artificial. You have apps telling you that they know better than you, you know that’s not reality. So I think ultimately people will use this to leverage just really good relationships, just to meet people of the opposite gender or the same gender or maybe they are looking for something serious down the road, that’s really up to them. The way that people in the US use Hinge is pretty much the same, it is about finding that someone you can look at as a companion in the real world and not just someone who happens to be sitting in the coffee shop next to you. Digit: There’s this huge problem with Moral Policing in India as I’m sure you’re aware, and then there’s the genuine concern with safety. You must’ve surely seen the kind of ruckus that was created about Uber recently. People do tend to shoot the messenger. Any thoughts? If at all something unfortunate happens as a result of people connecting because of your app what will Hinge’s stance be? Samir: I think first and foremost, we take matching to meeting very seriously. We have curated the app for the Indian community, very much based on the cautionary measures any app would take about meeting people. Once you look at the DNA of Hinge, you will realise that these are the people you would have met in real life. These are people, as I said that are just around you but you haven’t seen them yet. They’re kind of right in front of you but you haven’t met them yet. With that being said, there still is a strong caveat that any attempt to go and meet people whether it’s through an app or not, you have to really get the person and take that seriously. Justin: We are not introducing a new method, the practice isn’t new of meeting through friends. All we are doing is making that easier, accelerating that process so in that sense Samir’s point of us being agnostic as to whether this is being used as matrimonial or dating or casual, it is whatever you’re looking for. The way you are currently meeting through friends when you meet new people, we’re just helping you do that. Digit: We have observed online dating change through the years, shifting from the web to mobile. How is Hinge trying to bring a change or improve online dating in general? Is Hinge late to the party? Justin: I don’t think Hinge is late to the party. Even the term online dating, is not even the same thing. What you would do on OkCupid or Match.com is very different than what Hinge does, and I would even put Tinder into that category too. I think the reason that there was so much stigma for such a long time in online dating is that it was a fringe market. You would use it if you were having trouble in the real world and you were willing to pay money and go through all that trouble to fill out those profiles. There was a stigma associated with it. When Hinge and Tinder came along, we were using ambient information, we were using either your Facebook social graph or your current location and we were using that information to introduce you to people in a really lightweight way. And I think that really changed the paradigm for so-called online dating because it is so easy, why wouldn’t you do it. No longer it is for desperate people, it’s for anyone and I think that really helped break down the stigma and the only remaining stigma is really just legacy left from the Match.com and OkCupid days. So, I think we are at the forefront of bringing down the barrier and I think it’s only apps that makes the process as easy, ambient and tied into your real life as something like Hinge that are actually removing the stigma. Digit: What are your users saying about the app after they have actually met people? Justin: We have tons of stories, we get written to everyday about people who are in relationships or have gotten married or engaged, and there are Hinge babies now also. Recently a couple of weeks back, I had a really good friend of mine from high school write me to say that she got engaged to someone that she met on Hinge. We have a ton of anecdotes and user stories about people finding relationships. I will say that certainly Hinge attracts a demographic, that hasn’t been attracted to online dating in the past. And people who are influential or famous will actually use Hinge, because you are protected by your social network and the matches are curated, you’re not searchable. I think it feels a lot safer and the environment feels a lot curated and more natural and it attracts people who wouldn’t post a profile on OkCupid. 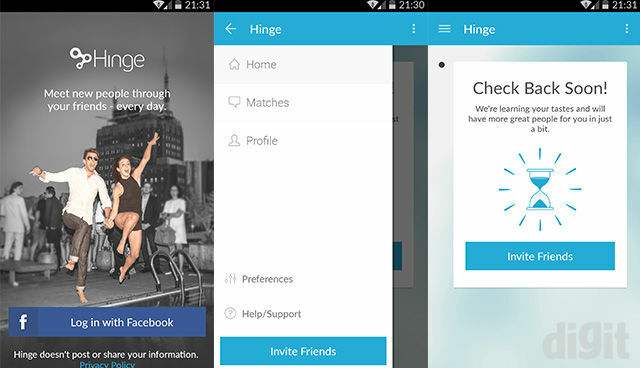 Hinge is now available for download in the Play Store and App Store (Currently operational only in Mumbai).